Why have one sweet spot when you can have 360 degrees of them? Rich, velvety sound - at least, of what I could hear in the open din of the Samsung CES booth - and striking design distinguish the intriguing omni-directional speakers. Samsung has long focused on design. So it doesn't surprise me to see Samsung launch a series of stylish speakers with a look, and a technology, heretofore unseen. 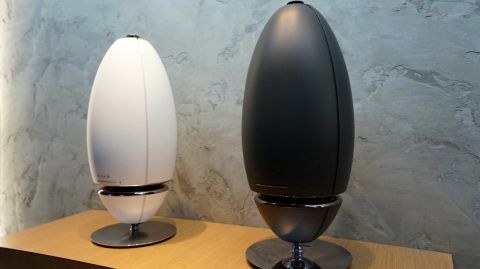 Called the Samsung Omni Directional Experience, there are three versions currently planned, including the WAM7500, also called the "Solo," a tabletop speaker that comes with a stand, and the WAM6500, a portable model with a six-hour battery. Another slightly larger so-called "Stand-type" model was shown at CES 2015 as well. No model number was announced in Samsung's materials, but a representative at the demo area called this larger one the Duet because it will be sold with a subwoofer. This model will come with a three-legged chrome stand, with a cable management conduits to allow the power cable to flow gracefully down the leg of the stand. All models work with Samsung's multi-room wireless audio platform, introduced last year as Shape. The speakers are scheduled to come out in the second quarter of 2015, but Samsung had neither pricing nor specifics on availability to share. The speakers are the first designs to come out of Samsung's new audio lab in Valencia, California. The secret sauce here is the inclusion of Samsung's proprietary Ring Radiator technology. The technology adds a ring to the speaker's design, for omni-directional sound across both horizontal and vertical axis. The result: Audio that sounds the same no matter where you stand in a room, or the speaker's sphere of influence. The concept of a "sweet spot" for the speakers was replaced by the idea of 360-degrees of sweet spot. The speakers produced rich, balanced audio, near as I could tell, of course, with the loudness of the Samsung CES 2015 booth blaring around me. Still, the music I heard had a pleasing clarity to it. I reserve full judgment for when we get the shipping speakers to try out in their final form. Another caveat: In the demo space, it was unclear which speakers were activated, and what the audio was like without the tremendous black subwoofer stuffed into a corner, and artfully blocked by a tree. When I commented on the size, and design, of the sub, a Samsung representative at the booth quickly assured me that engineers told them this is not the final design of the subwoofer. That's a good thing, since the beauty of the speaker itself is completely offset by the hunk of black blockiness that is the subwoofer on display. The subwoofer may have measured as large as two feet long and stood at least a foot tall. Hopefully, Samsung will have a superior design ready at the launch, but at CES, that clearly wasn't ready. Nor was Samsung's Multiroom App 2.0 software app ready for consumption. What little was on display, showing how you could navigate your music library, looked visually attractive, but the app wasn't ready to show off how you could pair speakers or change up the configuration of speakers in a room, for example. In that regard, LG's app for its Music Flow system was much farther along. The app shown was for Android only; an iOS version is coming at launch. Furthermore, Samsung had precious little additional information on the speakers. The ring radiator was the "big" technology innovation that enabled the 360-degree sound. That circular slit enables the encompassing surround sound, and it has an LED light that can come out of it as well (the source and control of the light was unclear). The ring could be at the base of the speaker, as in the battery-operated model, or higher up in the middle. Samsung reps said the ring's location was merely an aesthetic decision, but they had no engineering information to back up that statement. A cut-away drawing on display showed the insides of the speaker, where the woofer was in middle of the cone, and a tweeter was located way up at the top. Speakers can be hung, or placed on a shelf or stand. Samsung did confirm that you could pair up to 16 speakers together. Also, the 2.0 version of the app will support having all of them playing the same thing, or you could have each play different audio. The sound I heard was promising, and made me intrigued to hear more. It also makes me hope that after teasing CES attendees with the speakers' sound, Samsung prices them so they're affordable and not in the stratosphere.